My time as a Mount Vernon Life Guard Fellow is coming to a close, just several more days and I will be heading home. Much of my time the past couple of days has been spent on writing my archaeology lesson plan. Saturday and Sunday I spent a lot of time struggling with how to write my lesson plan. My goal all along has been to create a two day lesson for middle school classrooms to expose students to some of the basics of archaeology and incorporate some of the findings from archaeological sites here at Mount Vernon. I had planned on doing a "basics of archaeology" activity the first day and then have students divided up in groups to explore one of five possible sites here at Mount Vernon but when I began writing the activity for day one it seemed to long and wasn't specific enough to Mount Vernon. Sunday I changed course and decided to design the entire lesson around the Slave Cemetery Site. I have the most knowledge of this one from volunteering at the site while here and there were compelling ways in which to teach some of the fundamental archaeology concepts while explaining the history of the site. I did have several meetings today scheduled as well. My first meeting was a visit with Jaclyn Jecha, Manager of Library Education Programs Mount Vernon, about the Missouri Teacher Weekend Program. I was a attendee at last fall's Missouri Teacher Weekend workshop here at Mount Vernon and she wanted to ask me about my perceptions of what worked with the scheduled activities last fall - my answer : EVERYTHING! It is a great experience over four days in which Mount Vernon brings in terrific speakers, organizes tours and activities and provides an opportunity for teachers to learn more about Washington that they can bring back to their classrooms. The deadline for applications for Fall 2015 just closed this week. It is a great experience that I suggest all Missouri K-12 teachers look into in the future. After lunch I headed over the archaeology lab here on site at Mount Vernon. I had been working on my lesson plan and wanted a chance to ask one of the archaeologists a couple of questions on topics I was including in my lesson plan. Eleanor Breen, Deputy Director of Archaeology at Mount Vernon, was in and was very gracious with her time in answering my questions and providing me with some images from the site that I could use in my lesson. This is truly one of the amazing things about being here onsite as I work on the lesson. One minute I am in the library working on the lesson plan focusing on the site and then a couple of minutes later I am in the archaeology lab visiting with an archaeologist who works the site and asking questions to make my lesson more complete. I had a couple of questions about one specific artifact found at the site last year, one of only a couple artifacts that are not prehistoric. 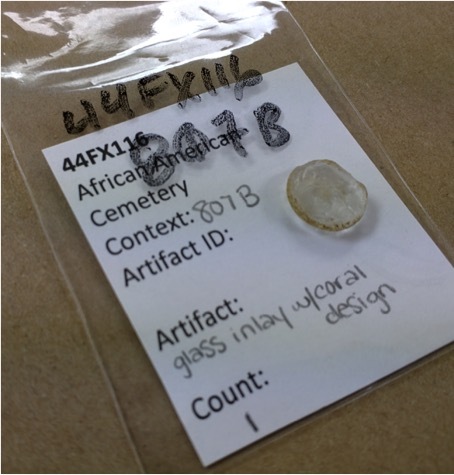 The artifact is a glass disc found at the site. It would have had a brass button around it and been used as a cufflink. The disc has a coral design on it and an almost identical disc had been found at the excavation of the House for Families slave quarters here at Mount Vernon. It is a very interesting find and of course can can lead to many discussions. I was able to see it up close and hold it. Next I had an afternoon meeting with Dean Norton, Director of Horticulture at Mount Vernon. Dean is the man when it comes to anything related to flowers, gardens or landscape at Mount Vernon. I wanted to ask him a little about his role in the archaeology of the Upper Garden which took place several years ago here at Mount Vernon. The goal of the Mount Vernon Ladies Association is to make the estate as realistic as possible to what it appeared like at the time of Washington's death in 1799. The upper garden had been restored to be a beautiful garden but wasn't accurate so they recently spent five years doing an archaeological study of the upper garden and now have it as accurate as possible. Dean is also one of the authors of The General in the Garden, an amazing new book about how Washington planted his flower and vegetable gardens at Mount Vernon. After my meeting with Mr. Norton it was back to writing my lesson plan. It is getting closer to being done. The toughest part is decided what to put in and what to leave out since I have so much great material.